This past week when it was time to make this tasty taco dinner, I wanted to be sure I had enough daylight to take photos. J had some work appointments and I wasn’t sure if he’d make it home before dark so I decided that, just this once, I might have to make dinner, take photos, and eat without him – leaving him to reheat when he got home. I know, I know…lots of people do this on a regular basis, but I try really hard to time dinner around when he’ll be home, if at all possible. He’s not spoiled much, is he? Anywho…it worked out that he made it home in time so we ate dinner together and I got my pictures taken! Oh, and the tacos…were delish! 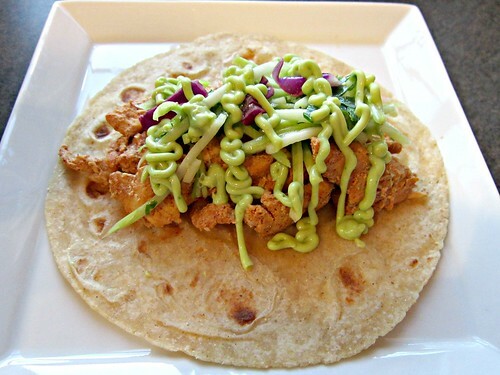 I used broccoli slaw again (a new taco topping fav), and the avocado cream was sooo good! J took the rest for lunch the next day and we still have some of the sauce left, which we use on various things here and there for some added flavor. Because the chicken is cut into strips or bite-sized pieces, it cooks more quickly, which makes for one of those quick weeknight meals. I’d say in 20 minutes or less you could have dinner on the table. Who doesn’t like that idea?? Heat a large skillet over high heat and spray with cooking spray. Combine chile powder, garlic salt, and cumin in a large bowl, add chicken pieces and toss to coat. Add chicken to the heated skillet and cook for about 4 minutes, stirring often, until cooked through. Meanwhile, combine zest, 1 tablespoon lime juice, Greek yogurt, milk and avocado in a blender or food processor and process until smooth. In a medium bowl, combine the remaining 1 tablespoon of lime juice, broccoli slaw, onions, cilantro, olive oil, and salt. Stir to evenly coat. To assemble the tacos, warm your tortillas and top with chicken, a 1/4 cup of slaw, and a good helping of the avocado cream. I put mine in a squeeze bottle, but you can just use a spoon.